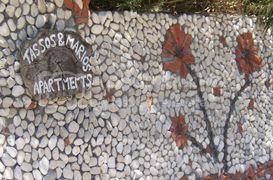 Always wanted to stay here, http://www.ammosapartments.gr/en-vrisaki-house.php just above Shoestrings but whenever we get holiday dates/flights it's always fully booked so I went direct to the owner yesterday and have got three weeks end of May to 17th June, happy days . Obviously it's easier to book flights/travel first but just went for it, if we end up having to book a hotel somewhere before/after for a few days so be it. Yes, all the popular places seem to fill up really quickly. We have already booked White House studios for 2019. It does seem odd to book so far in advance but it was a good price with Tui and we love these studios. Verbally booked our June and Aug/Sept trips for next year, as usual around the middle two weeks of June and the last week of Aug into the first week of Sept. Just have to confirm accurate dates when Easyjet release flights. They are a month later this year so it's Oct to book June, think it will be back to 2 separate outbound/return flights or we'll go a week earlier as we did this recent trip to book an outbound/return on the same booking !!! Very strange (I'm not complaining) but I've just booked parking for next year (silver zone Bristol). Last year May/June it cost us £90 for two weeks; it's just cost me £95 for four weeks including fast track security and late return insurance . Strange (also went through Quidco so will get a few ££ back). Have booked for the end of the season for 2019 again flight and apartments separate. Not sure about May yet, Have booked time off work, but really need to get jobs done on the house. Have looked at packages for early / mid may and prices have risen quite sharply, so probably just leave it to the last minute to book in the hope of a good deal if I decide to go. Arrive July 21st staying at the Nikos. A little later than usual this year due to seat availability on the flight out.